Find Replacement Parts for Your Home Depot Hot Tub! So you got a great deal on a hot tub from Home Depot. While this mega chain has thousands of parts in stock, they do not specialize in repair parts for the hot tubs they sell. This is because there are simply too many components that go into a hot tub. Hot tub manufacturers buy many of their components from spa parts manufactures, and these will vary from company to company and even within a brand. For instance, some budget spas will have more standard equipment than the luxury line from the same manufacturer. For jets alone, there are thousands of variations – between size, color and style. It is a good idea to write down your spa make, model, year and serial number to keep for future reference when you require repair parts. You can also find labels on the spa equipment that will give you the specs for the replacement part you need. There are many big spa parts suppliers, like Balboa, Gecko, Waterway, Pentair, Lucite and others. However, these companies do not sell their products to the general public. So what do you do if you need to find replacement parts for your Home Depot hot tub? You turn to an online hot tub parts supplier that can help you find the correct part you need at a great price. 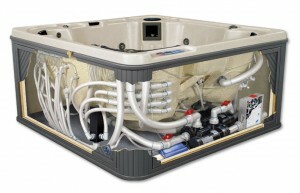 Some online dealers only carry replacement parts for a specific brand of hot tub or have a limited selection of parts. You will want to go to an online parts superstore – like Hot Tub Outpost – that has thousands of parts for all makes and models of spas. They can find you replacement spa parts for pretty much any make and model. To find your Home Depot spa parts online, you can enter the part number or description into their search box, or browse through the categories. If you still can’t find the part you are looking for, you can send a photo and description of what you need to their part matching techs. They will email you back a link to the exact part you need to order. That way, you know you are getting what you need. Of course, the Hot Tub Outpost also has some parts and accessories that are generic across all brands of spas. These include spa chemicals, aromatherapy fragrances, cover lifters, cleaning tools, safety rails, etc. To truly get all the items you need for your hot tub, you have to go to a hot tub supply specialist. Finding a quality one online will save you time and money over shopping at the brick and mortar stores.